Take to the Platform and go beyond swimming! Most of us have probably watched a swimming competition before on television. We can’t help but be impressed by how the athletes take off from the diving platforms into the air and transit smoothly into the water to kick off their race. Although, it may seem like a rather simple technique, it takes skills and precision to pull it off in a graceful and powerful manner. 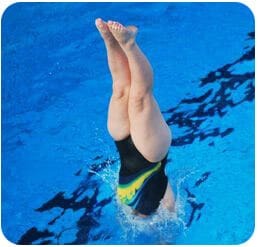 Not many individuals who learnt swimming actually proceed to take up diving lessons. This is because it is an additional skill that not many schools offer to their students. At Happy Fish, we believe that platform diving is a part of swimming and that it helps to bring your techniques to the next level. Anyone who has swimming skills can pick it up and it isn’t just suitable for professionals alone. Hence, we are providing you with this unique opportunity to dive like a pro! The best part of it all is that we cater to both children and adults of all levels. By teaming alongside Aerotumblers Diving Club, we have devise diving programmes for complete beginners, recreational participants, and even those with aspirations to qualify for National Squads in the future. Most of the water-based lessons will be conducted in Queenstown Swimming Complex. It is an extremely conducive place for platform diving as there is a separate diving pool with varying platform heights (1m, 3m, 5m and 10m boards). Aside from that, there is also a warm up room and a trampoline. This ensures that you will be able to learn the basics and practice a wide variety of skills. As for the dry land lessons, we might also be using Toa Payoh Swimming Complex, which is the base of the Singapore National Team. At this facility, the availability of a dry diving board and safety harnesses enables us to safely teach new skills and practice harder manoevres. This will provide you with a meaningful and fruitful learning experience. A fun programme that will introduce basic diving skills. Using shallow water, poolside and the one metre springboard, participants will learn how to enter the water safely and effectively from both forward and backward starting positions, as well as the basic elements of headfirst entries. This programme is a progression from Splash It! Participants will further develop their poolside and one metre skills, introducing more difficult diving elements in the different ‘groups’ of forward, backward and inward. They will also find themselves developing skills from the three metre springboard! This is the final stage of the Learn to Dive programme. The participants will be learning to twist and somersault, as well as continuing to perfect their skills going forward, backward, inward, and reverse. Rip It! divers will continue to conquer the three metre springboard, as well as getting a chance to venture up to the five metre platform. These classes are catered to adults of all levels of the sport. Beginners will be taught the basics of the sport, including jumps from a variety of heights, head first entries, forward dives, somersaults, and backward dives. The emphasis is on increasing confidence and learning new set of skills. Participants with previous experience will work with our coaches to set their own learning targets in order to meet their desired goals. All participants can expect to see improvements in their strength and flexibility, as well as their coordination and body awareness. When and Where is the lesson held?